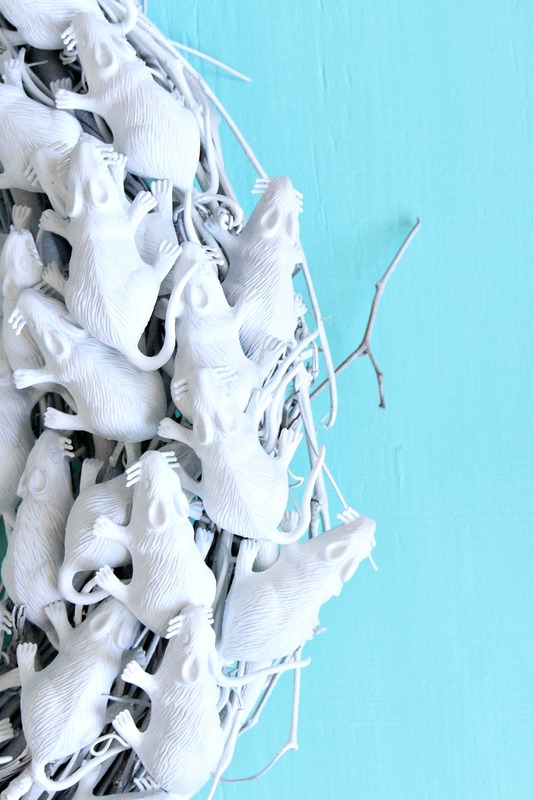 I originally bought and spray painted 30 plastic rats for a last minute Halloween costume idea but as soon as I lined them all up to admire my handiwork, I suddenly envisioned a wreath and became so much more excited about this idea instead! Yep, it’s a little last minute but that’s how I roll. I spend so long hanging on to summer every year that Thanksgiving and Halloween always sneak up on me – I only just decorated my pumpkins! (Check out my quick and easy marbled pumpkins here if you missed them). Because Halloween is looming, I’m thrilled that my new Halloween wreath only took about 10 minutes to whip up. I’m not a huge fan of the classic Halloween palette of orange + black (although I do enjoy Orange is the New Black, lol), so I love this Halloween wreath idea because it’s minimal and all-white – perfect with my blue and turquoise decor! – but it still has a ghostly, creepy, (kinda cute), Halloweeny vibe. 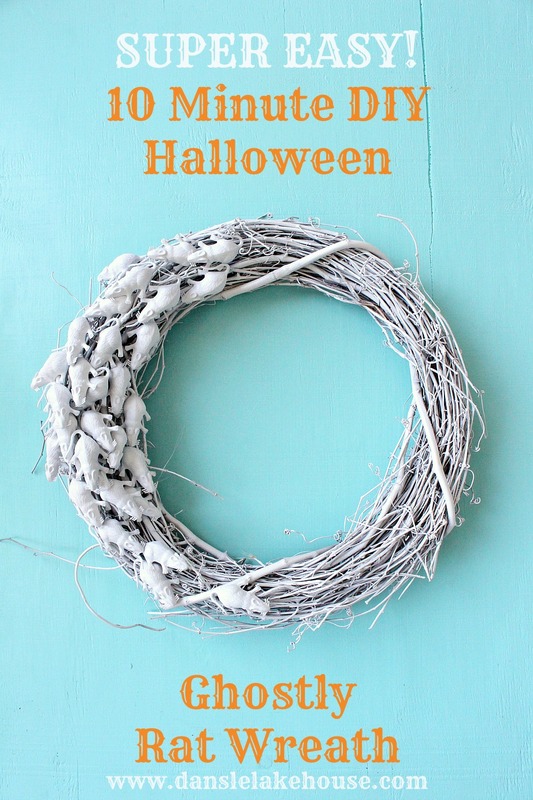 If you’re doing this Halloween thing at the last minute like me (or, as Hubby put it, getting ready for Halloween 2018), you’ll love this quick and easy Halloween wreath idea. 10 minutes to make – tops! 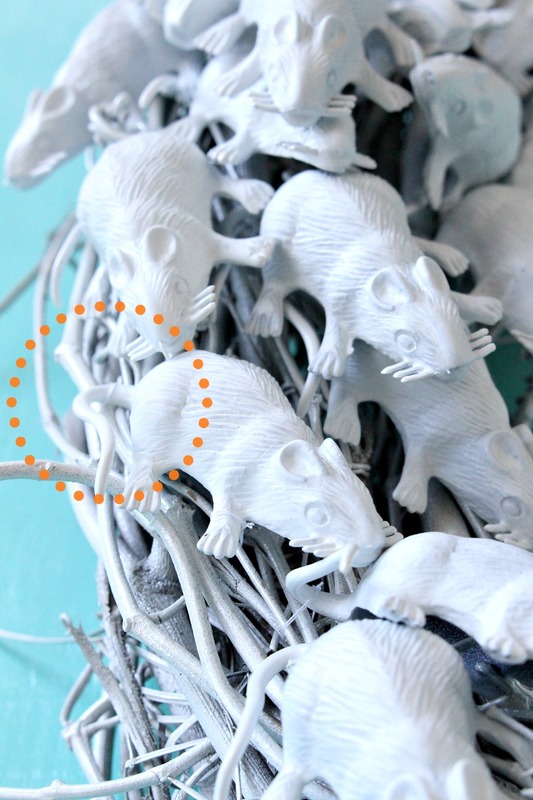 The first step takes two seconds: lay the mice on their backs and the gravevine wreath face down and blast with a quick drying spray paint. Let dry, flip everything over and blast with paint again. The whole process, minus dry time, took me five minutes. 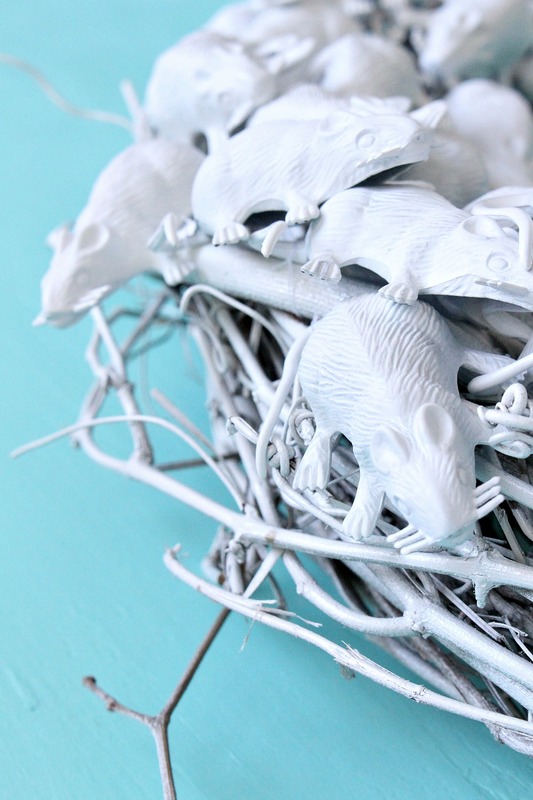 With the rats painted a ghostly white, I quickly affixed them to my grapevine wreath. Time for a little confession: as a DIY blogger it’s my job to come up with a steady steam of crafts and DIY projects and that’s such a sweet gig, but one thing that bothers me is how wasteful the industry can be. So many bloggers have admitted to disposing of their crafts immediately after pressing “publish” (never mind the perfectly lovely, beautiful rooms scrapped and decorated again and again for content). I understand that more content is the name of the game, but I try to be mindful of promoting an unreasonable preoccupation with the consumption of goods. Sometimes the sheer volume of STUFF in this world is really distressing. Honestly, I can be a little harsh on the environment, with my unnecessarily massive diesel-guzzling truck and hit or miss composting efforts, but I do try to not be wasteful when it comes to DIY and home decor. When I can, I reduce, re-use and recycle in my home and decorating pursuits – and that applies to my DIY supplies, too. 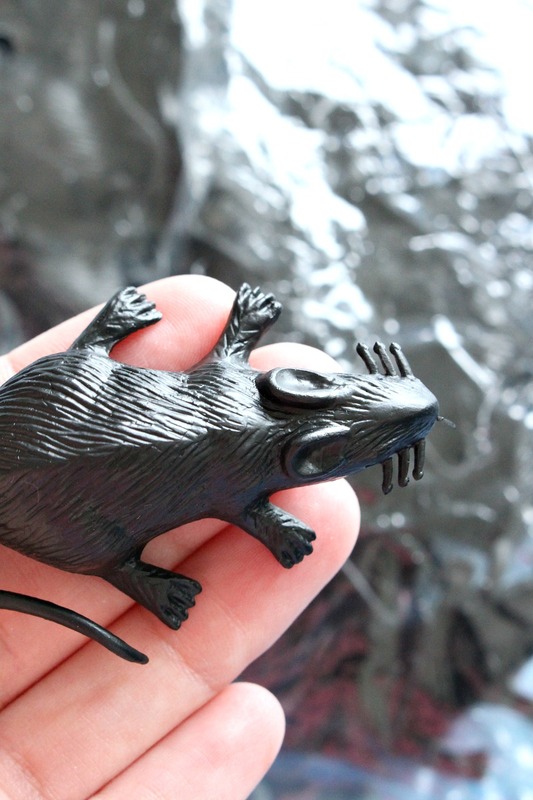 So while I recommend you take a dab of E-3000 glue (or any other tough, multi-purpose adhesive designed for plastic) and strongly bond these little rats to their new home, I opted to use string and secure them by their feet and tails for a secure, but not permanent, rat wreath. This way I can happily hang my wreath for the precious few hours before Halloween, and then re-use the rats and the wreath for another blog project down the road. Either method works, but gluing will take two seconds, the thread will take about 5 minutes. I used a large needle to help me navigate the thread around a suitable piece of grapevine, secured the tail and a foot or two with one loop and tied off the thread and snipped the end before moving on to the next one. Because the thread is the same color, you really cannot see where the thread has been tied. 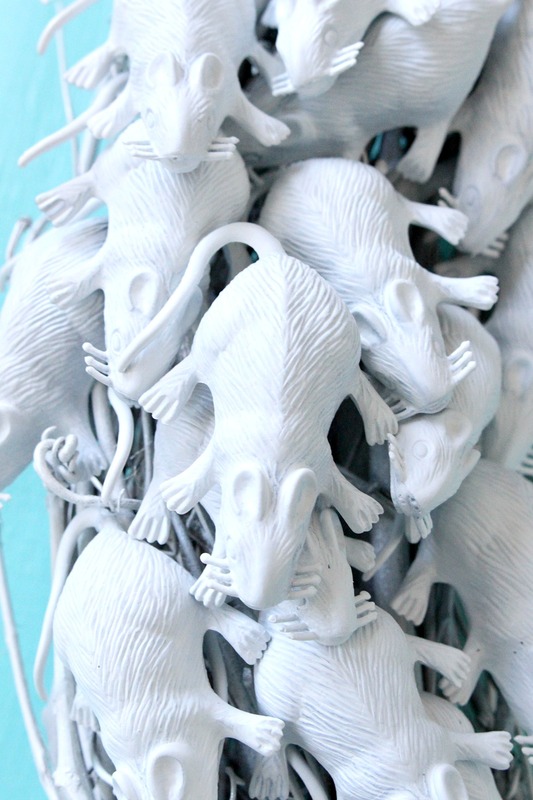 I overlapped my rats a bit to create a more spooky vibe of these ghostly cuties crawling all over each other. Spooooookkyyyy. Easy peasy! And I love these little faces greeting me when I come home. Please tell me there’s someone else out there who has left their Halloween decorating to the last possible minute too??? this is so fun! 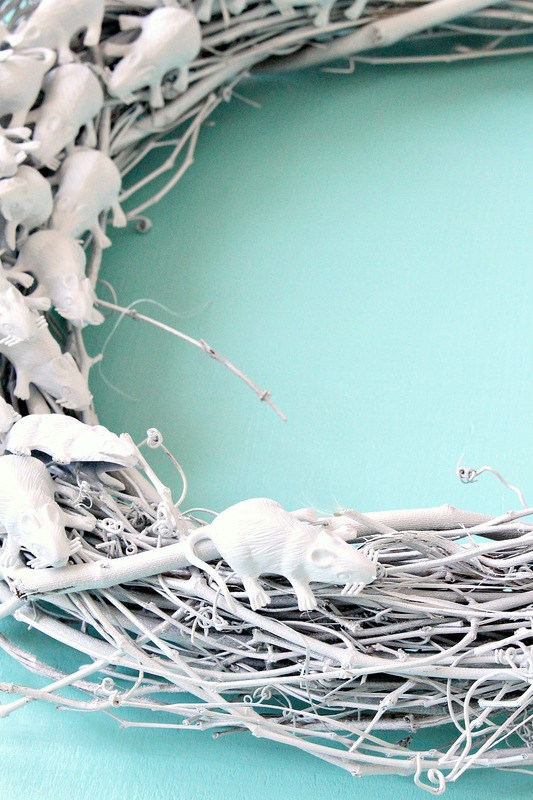 i made a very similar one years ago but i spray painted the wreath black and added black rats! Oh that’s awesome! Did you blog about it? I did a quick Pinterest search but only saw snakes and spiders – I’m always curious if an idea I’ve had was done before. Somehow I missed yours, otherwise I would have shared some link love! 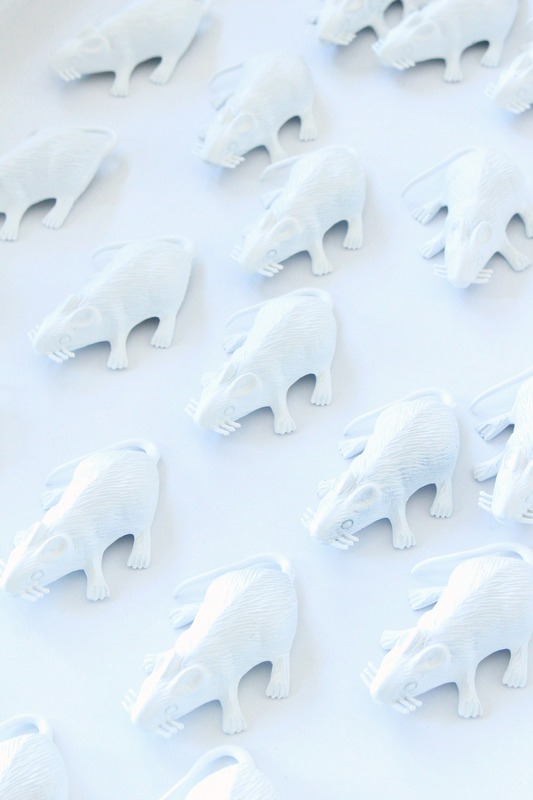 What costume were you planning with 30 little rats? Oh this is hilariously ghoulish! 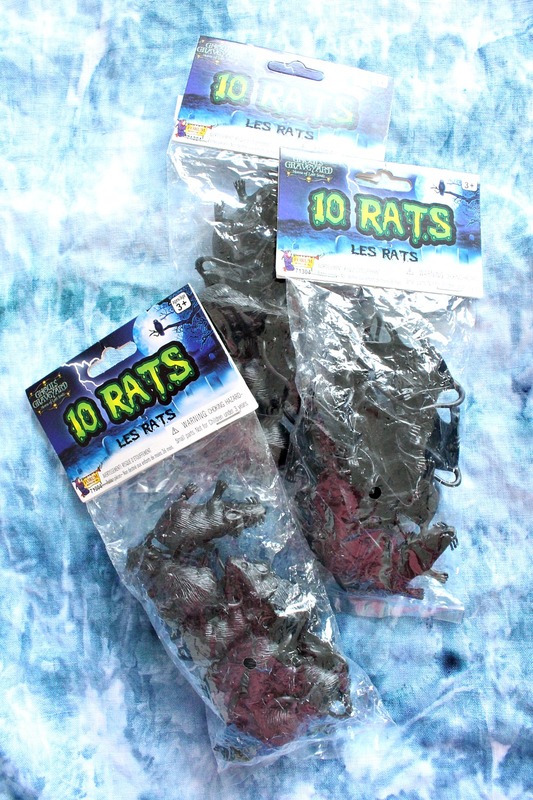 I love les rats! I'm a sucker for glitter, so these babies would have had a glitzy bath. Great idea Tanya! A glitter bath would be perfect!! Would shimmer under the moonlight – great idea!! OMG! This is both the best and worst idea ever! So clever yet so creepy. Haha, thanks Heather! Is it weird I think they’re cute? I have to tell you that this is pretty damn creepy but will appeal to anyone who wants something gross for Halloween. 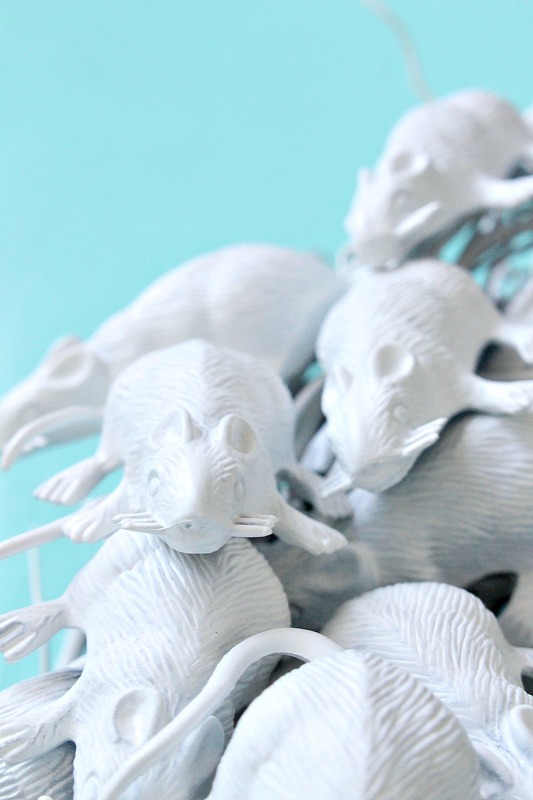 There is something about lots of rats, even plastic ones. Great idea! I don't know how I missed this fabulous post, but I am happy I found it when I went back looking for a past email. 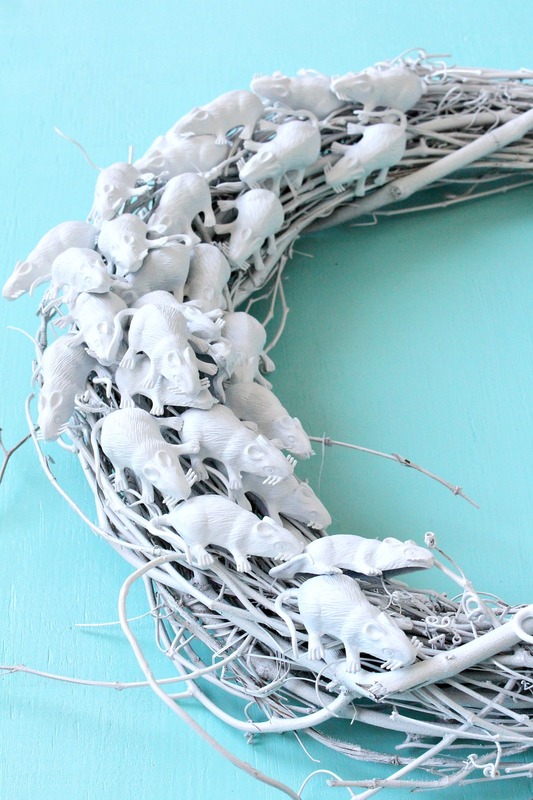 I will be seeking rats tomorrow so I can make this fun, fabulous wreath. Thank you for making me smile when I saw this. Cool! I’m not a huuuuuuge fan of Halloween either but I do like crafting and I’ll take an excuse, haha. I’ve gotten more into the spirit the last few years because I like making some easy decor pieces. I really try to recycle and reuse and I am far, far from perfect but it’s something that’s always in my mind. I am glad to know that readers encourage it!